The decade between 1904-1914 saw postcard sending & collecting reach staggering proportions. Many millions of postcards were printed, imported, sold, and then mailed by the tons. 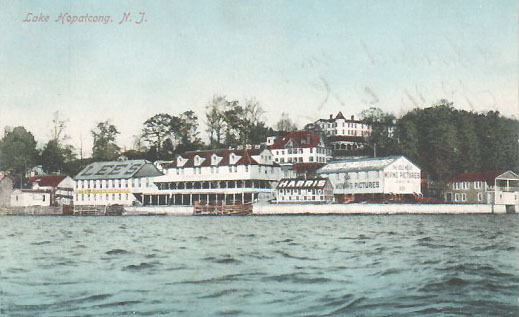 By the 1890's Lake Hopatcong had become the summer resort of choice by both the working class as well as the Captains of Industry and scions of Old Money. 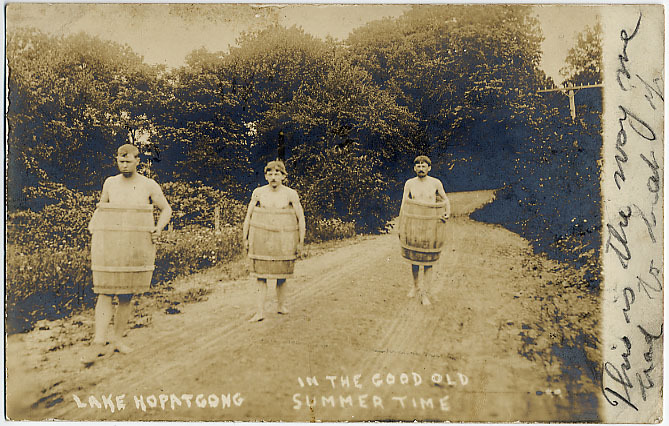 They all equally enjoyed the same cool summer mountain air and they all purchased Souvenir Photo Postcards of Lake Hopatcong scenes to send to their friends in the sweltering cities to the east. 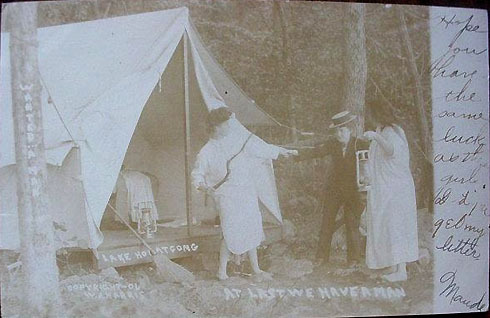 While photos of their Hotels were often sent, Novelty & Humor were frequent themes of these postcards. Three men and their barrels. Circa 1907, but it still works well 100 years later ! Water sports cooled down summer guests. These photos were considered 'very modern', and women are frequently seen in casual roles, reflecting the emerging Suffragette movement. Summer vacationers could go to the studio of W.J. 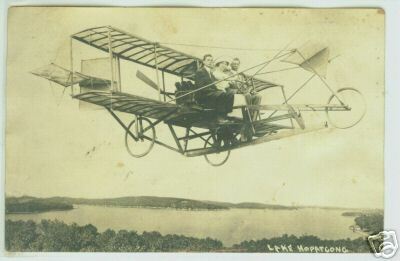 Harris on Lake Hopatcong and have their photo taken in a powered bi-plane, less than 10 years after the first powered flight by the Wright Brothers. 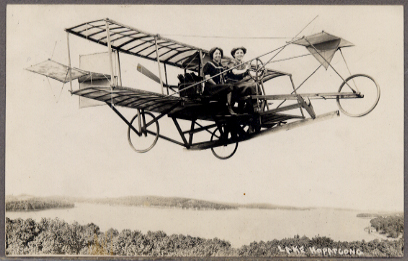 Of course, the plane was suspended in Harris' studio, and their 'flight' photo negative would be sandwiched with an aerial scenic, and the two printed together. Still, with flight so new, it probably fooled a few folks back home. In 1898, a combination of factors came together that started a bona-fide American phenomenon, "The Postcard Craze". In that year, Congress lowered the postcard postage rate to a penny, and a sales network of middlemen sprang up that linked German printers with small town American merchants (who wanted to immortalize Main Street on view cards) and retail outlets such as drugstores, bookshops, newsstands, and department stores, which strongly promoted the sale of postcards, since they required small amounts of display space and produced a good profit. The initial souvenir cards of vacation resorts and big cities, gradually evolved into diverse lines, which included view cards, comics, holiday greetings, and advertising issues. This diversity placed postcards within the means and interests of almost everyone. The decade between 1905-1915 -- the Golden Age of Postcards -- saw postcard collecting reach a zenith of staggering proportions. Many millions of postcards were printed, imported, sold, and mailed by the tons. In 1913 the number of postcards mailed had reached over nine hundred million. To supply the high demand, American publishers sprang up like wildflowers. Frequently, they had their pictures printed in Germany, with its' quality lithographic techniques. The publishers hired photographers who traveled all over the country. The large publishers, however, did not always reach the small towns with their photographers. So the local druggist, stationer, department, or novelty store sent photographs or negatives to Germany to be printed as postcards. Hence the name of some obscure druggist sometimes appears as the publisher. postcard offered an inexpensive and convenient way to capture people, places, and events. Whenever America paraded or celebrated anything, the postcard photographer was there. He was also there when disasters occurred, such as fires, floods, earthquakes, and train wrecks. Heroes and celebrities of all kinds were portrayed on postcards, as was home, mother and the Flag. They also covered love and courtship, humor, racial attitudes, sports, and Ladies in poses demure and not so demure. Of course, all the foregoing was in addition to the mainstay of the Postcard Industry: the almost infinite number of cards depicting America's main streets, civic buildings, schools, churches, businesses, factories, trolleys, railroads, amusement parks, lakes, rivers & mountains. At first postal regulations permitted only the name and address of the recipient on the back, so by necessity, messages defaced the illustrated side. In 1907, however, the Post Office Department relented: the back of the postcard could be split down the middle to provide space for both correspondence and address. The additional message space enhanced the use of postcards for communication at a time when people traveled less frequently, telephones were few and located only in stores and in the homes of the well-heeled, and the postal system was quite efficient. In many cities and suburbs of northern New Jersey, mail was delivered (don't faint now) twice a day. Thus, you could mail a postcard from your home in Bloomfield in the afternoon, advising your friend in Dover that you would like to visit him the next day, and when you got off the Train or Trolley and walked a few blocks to his home, Lunch would be waiting. To the general public postcards provided a convenient way to keep in touch with friends and relatives, without the burden of letter writing. They were the "e-mails" of the day. 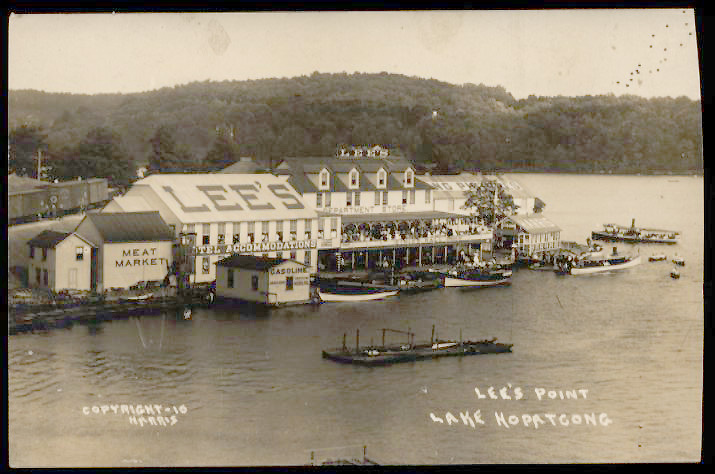 By the 1890's Lake Hopatcong had become the summer resort of choice by both the working class who rented tents on wooden platforms, as well as the Captains of Industry and scions of Old Money families who stayed in luxury suites at the finest Lake Resort Hotels. They all equally enjoyed the same cool summer mountain air. 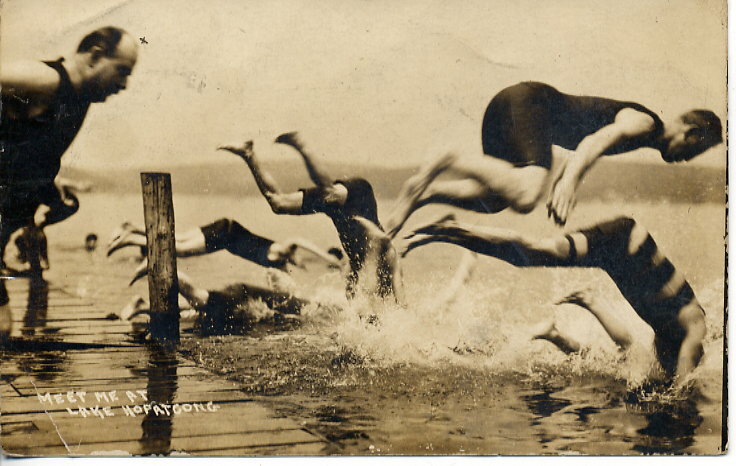 Another thing they had in common was that they all purchased Souvenir Photo Postcards of Lake Hopatcong scenes to send to their friends stuck in the sweltering cities to the east. German printers were the main suppliers of the Postcard trade until 1909, when the enactment of a Tariff greatly reduced importation of postcards, leading to a greater percentage produced by American firms. The outbreak of war in 1914 cut off access to Germany, and American printers did not possess the advanced technology to match the high quality of German lithography. There were a few exceptions, but in general, the standards declined and as a result, some began to lose interest in postcards. By 1913 folding multi-view greeting cards, with envelopes to retail at five cents each, began to be stocked in retail outlets, and multi-views with Lake Hopatcong themes began to appear. The outbreak of World War I in August 1914 had the effect of increasing Lake Hopatcong's summer population even more among the well to do, who had the means to "summer in Europe", but because of attacks on shipping in the Atlantic during the war were fearful of making the trip. At the same time that the War increased traffic to the Lake, it also shifted peoples minds away from fancies like postcards to more serious matters. While the sale of Souvenir Postcards at Lake Hopatcong continued strong through the 1930's, the overall Golden Age of Postcards had passed. Some of this information came from the Dept. of Special Collections, New York State Library. 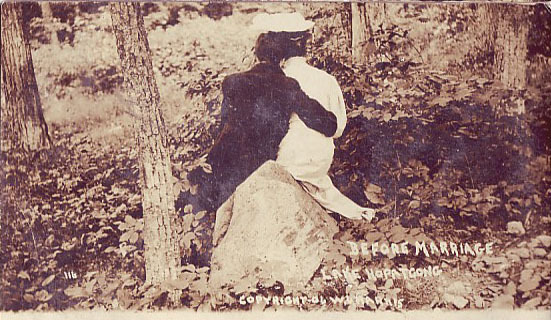 W.J Harris 1906 The most prolific Photographer to service Lake Hopatcong during the Golden Age of Postcards was William J. Harris. To this day, his "Real Photo Postcards" are eagerly sought by collectors, averaging from $8 to $30 on eBay. "Real Photo Postcards" are actually thick pieces of photographic paper, onto which the original sheet film negative is pressed under glass, resulting in an original real photo that has very high sharpness, sharper than cards from printing presses. William James Harris (1868-1940) was born in England. His family emigrated to America in 1870, settling in the Wilkes Barre, PA area. By age 20 he apprenticed under a local photographer. Within one year he started his first photography business while living with his parents and operated his first studio. In 1890 Harris moved to W. Pittston, PA where he began his career as a traveling photographer. He began utilizing the railroads to transport him, and his photography equipment, to the mountains, lakes, cities, and wherever else the summer resort crowd gathered. In 1898 Harris moved to a location that would play a vital role in his life. . . Lake Hopatcong, NJ. With it's 9 mile length and many coves, it is New Jersey's largest lake. 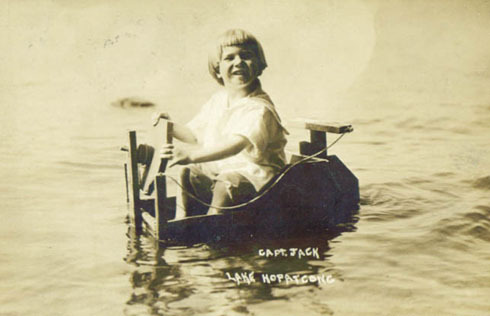 At the turn of the century Lake Hopatcong had become a summer mecca for the rich and famous. Conveniently located to nearby New York city, Lake Hopatcong offered an easy summer getaway from the city heat and many summer "cottages", which in many instances were more like mansions, began springing up around the lake. An emerging middle-class also flocked to the area, and Harris quickly recognized the opportunity for his photographic services here during the summer months. Harris set himself up on Nolan's Point, a part of the lake which was recognized as having the best sunsets. 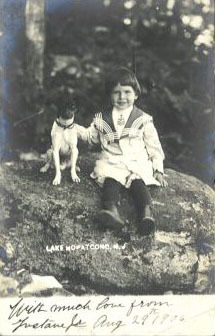 Soon tourists began flocking to his studio for their personal and family photographs to document their stay at Lake Hopatcong. In another move of public relations genius, Harris created his own personal "Floating Studio" in the summer of 1899. Replacing his land-based portable studio, this floating studio was actually a houseboat specially outfitted as a photographic studio. 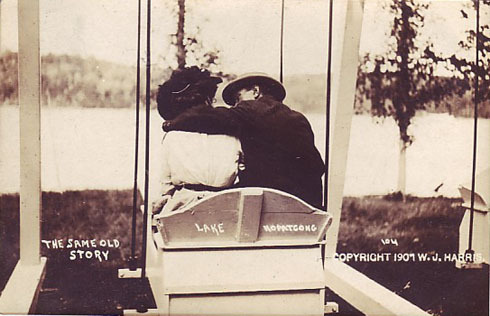 Called the "Harris Photo Float", this 16'x50' floating studio was capable of traveling around the lake, and even had a special porch for his famous sunset photos. Although other photographers were also working around the lake, Harris' floating studio and his zeal for promotion gave him an edge over the other photographers and he controlled a sizeable portion of the lake's photography business. Unfortunately, in 1903 Harris' floating studio sprang a knothole leak and sank, taking with it much of Harris' photographic equipment. But he quickly recovered from this disaster and went on to continue a long relationship with Lake Hopatcong. Harris also photographed throughout Morris County and especially Roxbury Township, and some of the best local photos of the time came from his lens. The Lees Lake Pavilion Hotel complex at Nolan's Point, Jefferson Township, circa 1910. The small building at far right has the word 'Harris' on its' roof, and is the W.J. Harris photo studio. 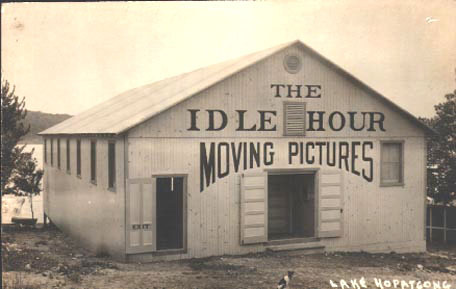 Behind it is a building on whose roof we can see "NG PICTURES", part of the "Moving Pictures" Idle Hour theater operated by Harris. The tracks of the Central Railroad of New Jersey are seen at left. Most visitors arrived by rail this way, with others coming by boat from the 2 docks at Landing. This complex burned down in 1924, and a smaller building went up in its place. Today the Jefferson House Restaurant is on the site, which continues to be known as Nolan's Point, not Lee's Point as the photo tries to suggest, in deference to the owners! Vacationers could spend their evening at The Idle Hour, owned by Harris. The silent films of the day had simple scenes strung together to tell a story and theater owners would hire a pianist to play music fitting the mood of the film at any given moment. No discussion of W.J. Harris would be complete without mention of Hypo, his dog and frequent presence in his photos. Look at most of his scenics, and there's Hypo in the lower part of the frame. 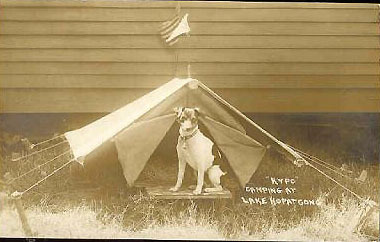 The photo above reads: "Hypo camping at Lake Hopatcong". 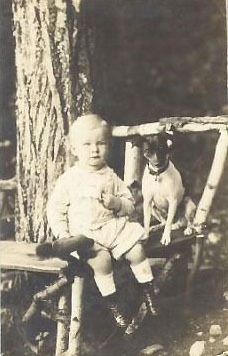 When families had their children photographed, Hypo was a great prop. By the way, the word 'hypo' refers to a liquid chemical used in the photo laboratories of the day. 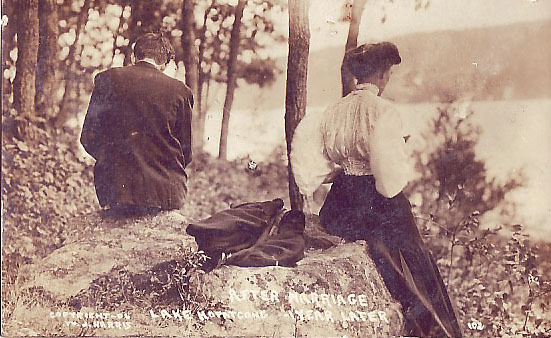 A number of Harris' cards poked fun at the theme of summer romance at Lake Hopatcong. 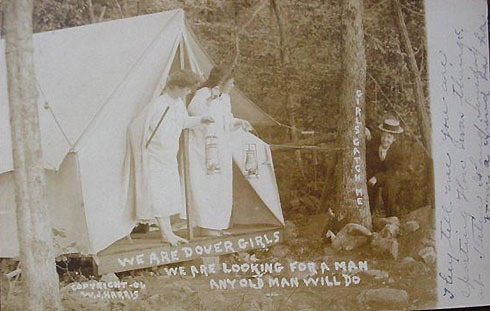 The 1906 series above shows 2 single Ladies, at left, with the inscription: "We are Dover girls, we are looking for a man, any old man will do". When a 'man' (the model in the photo is actually a women dressed as a man) wanders by, he is set upon by the ladies. A bit risqué for the time, and one wonders if it was sold above or below the counter!! 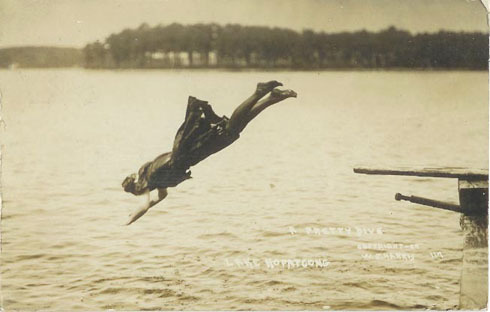 The 'gag' photo at left, "IT FLOATS", photographed at the Lake in 1906, was a setup: notice the rope around the ankles to hold in the stuffing used to give the model a 'zofftig' appearance. 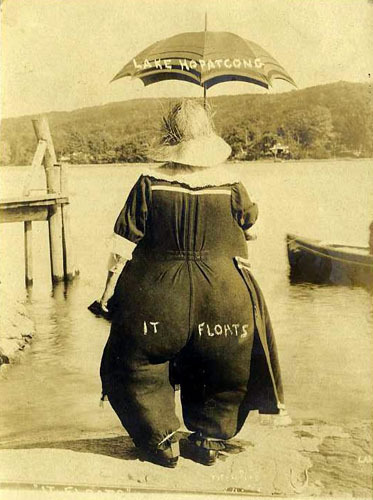 One of the trademarks of Harris were these Humor and Novelty Postcards. 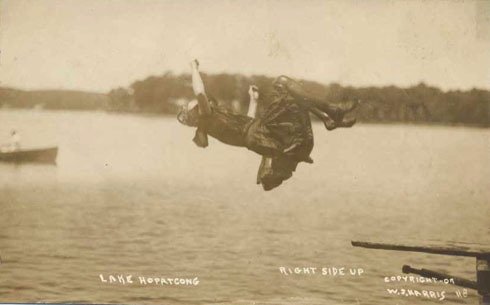 Vacation time at Lake Hopatcong encouraged people to loosen up a little and laugh, and humorous scenes were in high demand to send back to friends in the cities. Many scenes, hotels and homes were photographed to order and small runs of 'real-photo' postcards could be produced for a moderate sum as they were made directly from the original negative in a local darkroom without the usual printing plates of that day. Around 1901, William Harris married a local resident, Marion E. Briant of Dover, NJ. For the sake of completeness we should also mention that during the winters, from 1898 onward, Harris lived in St. Augustine, Florida where he opened the "Acme View Company". He busied himself in photographing the beautiful sights in historic St. Augustine and the surrounding Florida countryside, developing a thriving business in hand-colored photos of Florida tourist attractions.